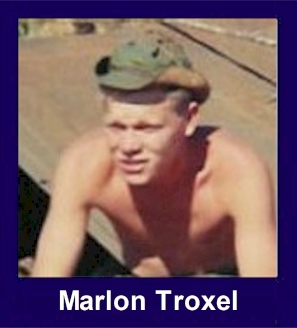 The 35th Infantry Regiment Association salutes our fallen brother, PFC Marlon Wade Troxel, who died in the service of his country on March 16th, 1969 in Pleiku Province, Vietnam. The cause of death was listed as Multi-Frag. At the time of his death Marlon was 20 years of age. He was from St. Paul, Minnesota. Marlon is honored on the Vietnam Veterans Memorial at Panel 29W, Line 57. The decorations earned by PFC Marlon Wade Troxel include: the Combat Infantryman Badge, the Bronze Star, the Purple Heart, the National Defense Service Medal, the Vietnam Service Medal, the Vietnam Campaign Medal and the Vietnam Cross of Gallantry with Palm Unit Citation. The Colonel put the yellow Teletype message in his pocket. He got into the green car with Army markings and gave the driver an address in North Ramsey County. The car passed through the gates of the Fort Snelling Missile battalion headquarters and headed out into the bright, almost warm March morning, stirring with the freshness of spring. "Colonel, it's too nice a day to have to go and tell somebody their son just got killed in Vietnam," said the driver. "Any day is too nice," said the colonel. But today, when the world passing by the car looked so beautiful with the promise of life, he thought was a mockery to the message in his pocket. As the car swung onto the freeway, Lt. Col. Donal Wells, deputy commander of the Missile Defense Center, sat back and tried to imagine how it would be and what he'd say and how he felt about it all. Two dozen, maybe three dozen of these rides he'd taken -- as an "additional duty" -- to tell people their sons or husbands or brothers had been killed. The boy whose name was on the message was just a lad of 19 or 20. Most of them are. The colonel thought about his own son, who is 19 and studying at Grinnell College. He'd have to go too, eventually. He looked out at the city, the people, imagining them working in offices, shopping in supermarkets, busy with their own lives, last night's dates, tonight's plans, business conferences, sales meetings. He got a fleeting glimpse of a café, with people sitting around at their coffee break, chatting about children, golf scores to come, the new boat, planting shrubs, about when to leave on Florida vacations, debating the Twins' chances, sales curves, new cars, taxes, the campus demonstrations, black power. They got up and went to work, drank two martinis for lunch, or a malt, went home, watched TV, went bowling, and it was a usual day. And out in New Brighton, on County Road H2, he was going to alter the daily lives of a family named Troxel. And wishing he didn't have to do it. That nobody did. Ever. For anybody. He looked out of the car and envied those he saw and at the way they were earning their living on this March morning. He almost wanted to lean out and shout: "Do you know what I have to do and where I am going? I am going to tell a mother and father their son has just been killed in Vietnam! Vietnam! Remember Vietnam?" But he didn't. He sat ramrod straight in the back seat of the car, his little "Survivor's Kit" by his side. There was nobody at home when he knocked on the door. But a neighbor came out in the yard and said Mr. Troxel -- Donald Troxel -- was working at the Zephyr Sales store at 3110 Emerson Ave N., Minneapolis. And "the Mrs." Works at an electronics factory on Silver Lake Road. Col. Wells told the driver to go to Emerson Avenue first. A hush stilled the usual activity at the Zephyr Sales store when employees saw the colonel's uniform. Mr. Troxel was out on a call. The colonel said he'd wait. It wasn't long. The colonel watched the man come towards him. "Mr. Troxel," he began. But he didn't need to say anymore. "It's Marlon, isn't it?" said the father. The colonel nodded. He watched incredible grief spread slowly across a man's face. And the colonel knew it would come back to him in a nightmare jumble with all those other faces he's seen. "He was the best son a father ever had," said the man. "Why, he had only been in Vietnam for three months." Mr. Troxel said he'd like to have the colonel go with him to tell Marlon's mother. There were frightened looks at the factory. "Could you go and bring her here and give us a private room," said Col. Wells. They did. Mrs. Troxel walked into the room, looked first at her husband, then at the colonel in his uniform. She, too, knew in a moment of despair. They rode home together with the colonel in the Army car. The colonel sat in the living room trying to explain all the survivors' benefits, the details of returning their son's body, the offers to help in any way he could -- and the Army could -- to two dazed people. "The Army could help," they said, "bring back our son. That's all it could do and it can't, can it?" "I wish with all my heart it could," said the colonel. He went back to the green car with Army markings and shivered. Now a cold wind blew brooding clouds like a shroud across a day in spring. Editors note: Marlon Troxel was a personal friend of mine. We got drafted, went to basic training at Ft. Campbell, KY, AIT at Ft. Lewis, WA, went to Vietnam on the same plane and ended up with the 4th Division. At the replacement center in Camp Enari, we got split up. Marlon was sent to B/2/35 and I went to A/1/8. He was killed in action on March 16, 1969 in Kontum Province. His name can be found on "The Wall" at 29W57.